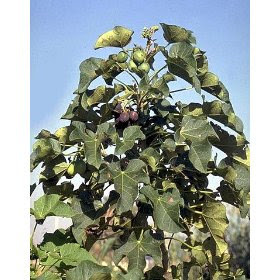 I'm asking my brother Steve, the expert gardener to experiment with some jatropha seeds that I found on Amazon. They're pretty cheap - $4, which is a buck less than the seeds for the incredibly hot pepper called naga jolokia seeds I asked him grow. Amazon refers to jatropha as "diesel fuel plants." That's probably hyperbolic. But the stuff does have potential I think. I became interested in jatropha because the Houston newspapers reported today that a Continental Airlines test flight earlier this year using biofuel intended to reduce greenhouse gas emissions achieved fuel efficiency slightly higher than traditional jet fuel. That's huge. During the 90-minute flight Jan. 7, test pilots put a Boeing 737-800 through various maneuvers, powered by one CFM International CFM56TB engine using 100 percent traditional fuel and one using a 50-50 mix of traditional and biofuel. The flight did not carry passengers and the airline did not set a timetable for using the fuel on regular flights. Fuel efficiency from the 50-50 mix was about 1.1 percent higher, the airline said. This is at least the second report of an airline using biofuels based from Jatropha, Air New Zealand just reported similar results with similar biofuels. So, this jatropha plant makes a lot of fuel, grows in wastelands, and needs no care or water. Hmm, is it time to buy stock in jatropha companies? Sales of Absinthe and Flamethrowers remain brisk. As of this writing, it's one of the 300 most popular books sold on Amazon. I'm humbled and grateful. Thanks to those who have read the book and shared their opinions. To purchase a copy of your own, click here. To some extent, fairs and amusements parks can trace their roots back to Roman Circuses. Although they incorporated bloodthirsty spectacle, the producers of such shows showed considerable creativity. One type of gladiatorial combat involved the “Venatio” or the slaying of wild animals. To produce the Venatio, wild beasts from every part of the Roman Empire were transported to Rome. Prior to gladiatorial duels (always the main event), animal “hunts” were held. Hundreds, perhaps thousands of animals might be dispatched in a single day in this fashion. For example, during Emperor Trajan’s inauguration festival, nearly ten thousand animals were killed. Animals that appeared in the venatio included: lions, boar, elephants, bears, dogs, and camels. The men who fought the animals were called the bestiarii, and they were often criminals and were compelled to fight the animals with feeble weapons and no protection. Despite the impression given by the bread and circuses public policies of the era, the second century AD was tough time for Rome. The distractions of the circuses were an important tool for keeping the Roman citizenry docile to the emperor and under control. Roman leaders often exerted control over the Roman masses not by offering bold and imaginative leadership but by appealing to people’s basest instincts. In the 3rd Century AD, the empire was in decline, buffeted on all sides by increasingly powerful Germanic neighbors, making it nearly impossible to exert tight control and provide effective government in many sections of the empire. Grasping at any opportunity, Roman emperors attempted to distract the people they ruled buy staging lavish and grotesque spectacles. And such distractions had the unfortunate effect of making the mob grow more ever more bloodthirsty. The emperor in 182 AD was Commodus. He was a man of unbelievably strange habits, a nearly impossibly cruel demeanor, and a completely unchecked ego. He went so far as to temporarily rename Rome “Colonia Commodiana” (Colony of Commodus.) Yet despite his numerous character flaws, the common people of Rome loved him. This emperor well understood the crudest and most primitive aspects of his subjects and he shrewdly appealed to the immoral nature of his times. He wasn’t the first emperor to do so, but there was something that set Commodus apart from the likes of Nero or Caligula. Commodus believed he was the second coming of the god Hercules, and to prove it, he set forth on his own Herculean mission. He became the most prolific and deadly animal fighter the world has ever known. While contemporary Roman writers often describe Commodus as a quite handsome man, surviving statues show Commodus to be rather jowly with an effeminately curly beard. Infatuated with the Greek god Herculesm, Commodus was obsessed with fighting animals in hand to hand (or hand to paw? Hand to hoof?) combat. For Hercules, as you may remember from classes in Greek mythology, endured twelve labors, most of which have something to do with hand to hand animal fighting. Some of his labors included slaying the Nemean Lion, the Lernaean Hydra, the Erymanthian Boar and the Stymphalian Birds. He also stole, rustled or otherwise committed shameful acts against the Ceryneian deer, the Geryonian Cows, and the Cretan Bull. In fact, if you were an animal of any reputation, you most certainly did not want to see Hercules knocking on your door. Commodus devoted most of his life to ease and to horses and to combats of wild beasts. In fact, besides all that he did in private, he often slew in public large numbers beasts as well. For example, all alone with his own hands, he dispatched five hippopotami together with two elephants on two successive days; and he also killed rhinoceroses and a camelopard (a giraffe). Imagine, then, a day at the Roman Coliseum in the second century during the reign of Commodus, now calling himself Hercules Secundus. The arena, decorated to resemble a cheesy, faux Serengi, is clogged with exotic beasts -- lions, bulls, horses, and a gorilla or two. Perhaps the animals are drugged, or hobbled, or perhaps simply confused by the noise and the crowd. In any event, Commodus, dressed in a lion skin and holding various weapons wades into the bestiary and cuts down half of Noah’s Ark to shouts of admiration by the decadent Roman spectators. The spectacle is hardly bloody enough to satisfy the bloodlust of the crowd. Before long, there are more animal carcasses on the ground than at the killing floor of the Chicago Stockyards. At the end comes the monstrous coup de gras: the Emperor cuts down an exotic animal with a 14-foot neck; a gentle, silent, cud-chewing giraffe. But this is just the morning’s entertainment. After that carnage, the gladiator fights begin. Ave caesar! Morituri te salutamus! Animal fighting is one aspect of Living Dangerously, and obviously one that has ancient roots. But in modern times it does not, in fact it should not, mean that animals must killed or injured. It simply requires a fair fight between man and beast, no guns allowed. There are plenty of modern examples of animal fighting that are part of the art of living dangerously. Fairs and amusement parks at the turn of the Twentieth Century were colorful, vibrant, and boisterous places. They offered an antidote to the strict moral codes of the period and offered exotic products and activities which curious visitors found irresistible: foot long hot dogs and salt water taffy, ferris wheels and roller coasters, and . . . kangaroo boxing. In the year 1900, the Boardwalk in Atlantic City was well known for its boxing kangaroo (whose name unfortunately is now lost to obscurity.) But by all accounts, it was a hell of a good boxer and was said by more than one spectator that it could probably give John L. Sullivan himself a run for his money. This was the heyday of man versus kangaroo pugilism. While kangaroo boxing was in vogue, mastering this Living Dangerously Art was a fast track to glory and admiration. At the Pan American World Expo in Buffalo, New York in 1901, one of the most popular attractions was “The Man versus Kangaroo Boxing Match.” One spectator was so enthralled by the event that she recorded the event in her diary in vivid detail. Her breathless description, presented below, has been reproduced exactly, including her spelling and grammatical errors. A man dressed in red tights entered, followed by a good-sized Kangaroo, who immediately made preparations for the contest. At the Refree’s request the contestants proceeded to shake hands after which the foxy Kangaroo made a swift lunge at the man and the fight was ON. The man immediately followed this up with his right and then the Kang got down to business and went for his adversary for fair, dodging his blows and raining one after another blow upon the mans neck and shoulders. Then when the man, seeming to getting the best of him, the Kangaroo would throw himself backwards, supporting his weight on his powerful tail and then he would strike with his fore feet and his hind feets at the same time. Each time he would succeed in striking the man in the stomach with his hind feet. On getting an advantage by these maneuvers he would follow them up by a succession of very sharp blows and at times during the performance the man was often made to know when he got "it" in the neck. Of course the man did not strike as hard as he seemed to but it kept him pretty busy to ward off the quick thrusts from the creatures stout arms. At last with a bound the Kangaroo struck the man on the chest and then as he lifted his arm to ward off the next blow the Kangaroo would pelt him again. "TIME" was called and the contestants were escorted to their corners to be fanned and rubbed down by their attendants. Again, they met in the ring at the first of the second round, and clinched and struggled, the kangaroo pelting blow after blow on the mans head. After 10 minutes of good solid scrapping the kangaroo landed an uppercut sending the man sprawling up against the bars of the arena. Time was again called and at the end of the third round the fight was called off - the Kangaroo being declared the VICTOR. The FIGHTING KANGAROO was a pretty creature with a soft coat of brown fur covering its body. Its eyes were soft and dreamy and during the fight when getting the advantage its eyes could be seen to sparkle with a mischievous light. To see this boxing contest was alone well worth the price of Admission to the show. The motes of kangaroo fighting evidently lingered in the air over Buffalo and settled on some of it’s residents. Thirty-four years later, a young man named Robert Donovan was promoted from copy boy to reporter by the Buffalo Courier Express. Ambitious and talented, he eventually became Washington Bureau Chief for the Los Angeles Times. Fast forward to 1966, when President Lyndon Johnson embarked on an Asian trip to seek support for his Vietnam policies. President Johnson asked Donovan, who covered the mission as Washington Bureau Chief for the Los Angeles Times, to box a kangaroo while the entourage was in Australia. Johnson remembers Donovan rooted loudly for the kangaroo. As the well educated and well connected Johnson proves, hand to hand animal fighting isn’t just for street toughs and down-and-outers. It’s actually quite popular among many Dangerous Livers. Randy Brinkley has done many interesting things in his life. He was the NASA Program Director who led the team that saved the Hubble Telescope. And before that, he was a Marine Top Gun fighter pilot, flying F/A-18 Hornets and AV-8B Harriers. But his most unusual claim to fame is that he is a monkey fighter. That doesn’t mean he fights like a monkey. Rather, it means he actually fights monkeys (orangutans to be exact), hand to hand. Okay, that’s a huge exaggeration, since he only did it once, But the point is, anybody who can run a company that builds rockets, fly a Mach 2 fighter jet, and then take on an ape in a cage match is a guy who understands the art of living dangerously. “I was in Georgetown, with other Marine second lieutenants, drinking beer and trying to impress a group of students. This group had gone to a nearby carnival where for five dollars you could get into a cage with an orangutan. If you could stay in the cage with the ape for five minutes, they paid you $100. But none of them were successful. “After several hours of strategy sessions and drinking beer, we devised a plan and we launched off to encounter the orangutan. “The monkey looked docile enough, 110 pounds, long skinny arms, just sitting there in the middle of this iron cage. I approached the monkey from the backside and grabbed it in a half nelson. To my surprise and pleasure, she offered no resistance. Then I made the mistake of lifting the orangutan off the ground. I had a big smile on my face. This lasted for about fifteen seconds, and then I noticed that this long, skinny arm had reached up and grabbed the iron bar over my head. I didn’t pay much attention to it at the time, until a few seconds later, I felt my feet leave the ground. I figured out the orangutan, who weighed 110 pounds (and I weighed about 230 at the time) had just done a one-arm pull up with something like three times her body weight. People have good days and bad days. Today, I'm pleased to say, I am having a very good day.Forgive me for tooting my own horn, but how often does this happen to a person? Top of page C6, Today's New York Times: Here's the full review. It’s only a few weeks before the Fourth of July, the time of year that the thinking person — or at least the type of thinking person who likes to hear things go whoosh and ka-blam — begins to consider how best to spend the holiday. Some guys, and I know who a few of you are, will be loading up the car in states where, unlike New York, the sale of fireworks is legal. (Those Phantom Fireworks discount cards can really burn a hole in your wallet.) Others like to prepare emotionally and mentally for the Fourth by getting some reading done. Two books that put me in the mood for rockets’ red glare are George Plimpton’s classic “Fireworks: A History and Celebration” (1984), and, less conventionally, Jim Paul’s shaggily artful book “Catapult: Harry and I Build a Siege Weapon” (1991). But when it comes to the theory and practice of making your own noisy, mildly dangerous fun in the backyard, America has a new poet laureate. His name is William Gurstelle, and he staked his claim to do-it-yourself greatness in 2001 with his friendly paperback book “Backyard Ballistics.” Its subtitle tells you all you need to know: “Build Potato Cannons, Paper Match Rockets, Cincinnati Fire Kites, Tennis Ball Mortars, and More Dynamite Devices.” According to the author, it has sold more than 250,000 copies. I keep a well-thumbed copy in the upstairs bathroom. It’s also a book that contains meticulous directions for making a real, live, beastly flamethrower in your garage — albeit the propane kind, not the ridiculously dangerous liquid-based variety. Mr. Gurstelle warns against incorporating Thompson’s hallmarks — “shotguns, LSD and anarchy” — into your lifestyle. Because you are not Hunter S. Thompson. And because he does not want you to die stupidly and young. Just as important, he observes, it is hard to make playing with shotguns, LSD and anarchy artful. And for him, style, ingenuity and playfulness are everything. Mr. Gurstelle exactingly describes how to make your own gunpowder, a substance he calls “the most significant chemical compound mankind has ever developed.” It’s the foundation for many of his book’s activities, the same way the perfect fish stock undergirds dozens of recipes in a cookbook. Making even small quantities of gunpowder, he adds, “puts you in the rarefied company of such important historical figures as Joan of Arc, Roger Bacon, Mark the Greek, Lammot du Pont, Black Berthold and Leonardo da Vinci.” From there, he’s on to making things like fuses, rockets and an eprouvette, or small cannon. 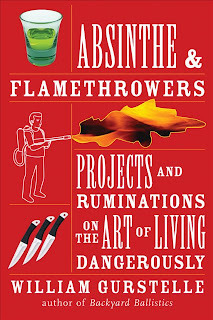 “Absinthe & Flamethrowers” is not “The Anarchist’s Cookbook Redux.” Making your own gunpowder or small-scale rocket is real work, hardly worth a terrorist’s time. When Mr. Gurstelle begins to explore things like drinking absinthe, mastering bullwhips, eating hot chili peppers and throwing knives, his book runs briefly into the shallow weeds. There is even a disquisition on “danger dogs,” that is, hot dogs wrapped with grilled bacon. That’s not edge-work, it’s pigging out. I have nothing against any of these things, but Mr. Gurstelle is at his best in the garage with a “This Old Tennis Ball Mortar” sort of project. Bravo, sir. It’s the kind of speech you want to punctuate with a potato cannon blast. 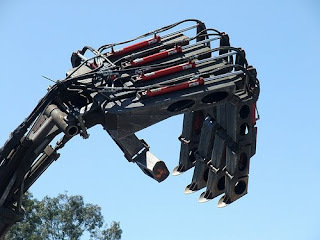 My friend Christian Ristow was at Maker Faire with his giant pneumatically powered sculpture called Hand of Man. It’s great. It’s a highly interactive piece in which one puts on a glove with sensors and controls a multi-ton pneumatic hand capable of picking up and crushing a refrigerator. I've known Ristow for years, ever since I interviewed him for a book and we stayed in touch. 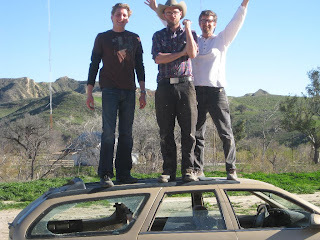 About a year or so ago, I worked on a TV pilot for Discovery Channel starring my friend Christian. He is perhaps the most gifted mechanical artist I’ve ever met. Ristow designed a machine gun potato cannon which was a true machine gun spud gun. It had a gravity fed magazine that fed spuds into the firing chamber. There were four air tanks with solenoid valves that could shoot potatoes continually and at high velocity at a target until the magazine was emptied. I dubbed it "the Quadra-tator." The airtanks were massive and could hold plenty of compressed air. I calculated the muzzle velocity was well in excess of 85 mph. The rate of fire depended on the speed with which you turned a crank. The crank controlled five pneumatic solenoid valves, one for the magazine loader and one for each of the air tanks. It worked absolutely great. We could get 20 or potatoes in the magazine and could empty the thing in much less than a minute. For the finale, the Quadratator, along with the gatling gun that Dave Mathews built, destroyed a car with it. It's been pretty spare here on Notes from the Technology Underground lately. That's because I've been posting on my friend Mark Frauenfelder's well known blog, BoingBoing. 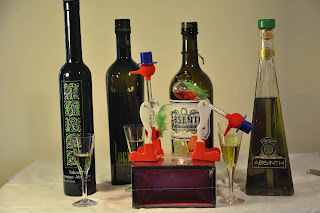 I've written about 10 posts so far and the most popular as been the post on Absinthe. It took a while, but I'm starting to develop a taste for the anise and wormwood combination that flavors all absinthes. I got several bottles from several distillers evaluated them. There are several good ones, and a few not so good. I'm very impressed with Taboo from Okanagan Distillers and Kubler from Altamar Brands.